Our A Dazzling Mix save the date cards certainly live up to their name. A decorative white banner cascades from side to side, displaying a myriad of decorative wedding fonts to announce your big news. 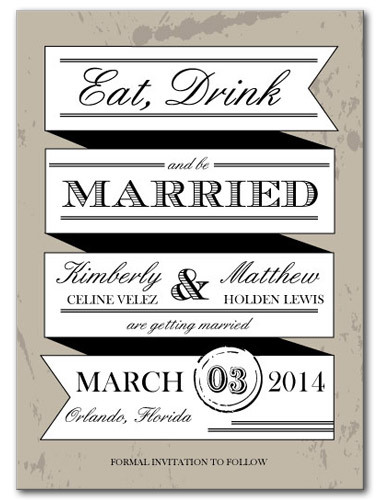 A splashy black and white display seals the deal, with an ink blot background for a laid back, grunge chic display fitting for modern couples. A Dazzling Mix For the best experience, we recommend personalizing your stationery on a desktop computer.